In this article, we review the different pet insurance policies available and compare the costs and cover to help you find the best rabbit insurance for your bun. Which pet insurance companies offer rabbit insurance? What does Rabbit Insurance cover? How much does pet insurance for Rabbits cost? Can you compare quotes for Rabbit Insurance on a price comparison website? Can you get Rabbit Insurance with no excess? Is pet insurance for Rabbits worth it? There are seven pet insurance companies who will offer cover for rabbits. Perhaps the best-known insurer of rabbits is the UK's largest pet insurance company, Petplan. Rabbit insurance is also available from Helpucover (part of Pinnacle Insurance). The retailer Pets at Home has partnered with Petplan to offer rabbit insurance to its customers. InsureandGo who offer a range of different insurance products also offer cover for rabbits. They work with NCI to provide this. And finally 4Paws a brand name of NCI insurance also offer cover for rabbits. ExoticDirect offers £2,000 of cover for rabbits' vet treatment, due to accident, sickness, or disease. ExoticDirect charges about £153 per year to insure a rabbit, with the option to spread the costs across 10 monthly payments. Up to three rabbits can be added to each policy. There are two policy types to choose from: The Essential policy spreads the vet fee cover across all the rabbits insured on the policy, and Premier offers £2,000 of vet fee cover for each pet on the policy. The premium changes depending on how many rabbits you cover, and which policy you choose. Exotic Direct is rated 4.2 out of 5 by its customers, based on 65 customer reviews on the company's Facebook page. You can get a quote for Rabbit Insurance at the ExoticDirect website. Petplan also provides £2,000 of vet bills cover, as well as £750 of complementary treatments cover. As Petplan rabbit insurance is a "covered for life" policy (also known as a lifetime rabbit insurance policy), it will continue to pay out up to these limits year after year, even if a rabbit develops an ongoing medical condition. Insuring a 3 year old male rabbit with Petplan costs from about £16 per month. Petplan also offers a 10% online discount. According to reviews website Feefo, Petplan's customer experience rating is 4.4 out of 5. Helpucover provides the same level of vet fees cover for rabbits as Petplan through its Premier policy. However Helpucover's cost for rabbits is cheaper per month than Petplan's at around £10. Helpucover offer £750 of cover for complimentary treatments and £250 towards finding your rabbit if it gets lost or is stolen. According to reviews on Feefo, Helpucover's customer experience rating is 4.7/5. Better known as a provider of breakdown insurance, NCI also offers rabbit insurance. NCI provides £2,000 of vet bills cover and will also cover complementary treatments up to £750 and £250 of cover for advertising and reward for a lost or stolen bun. Read our review of NCI pet insurance for more information on how customers and expert reviewers see the company. Pets at Home have now partnered with Petplan to offer rabbit insurance. When you click on the link to get a quote you are taken to the Petplan website. The policy cover and premiums for a 3 year old Lop rabbit in a BN postcode are the same as those for Petplan, and don't differ in anyway. InsureandGo's rabbit insurance is arranged and administered by NCI insurance. We ran a quote for a 3 year old lop rabbit in a BN postcode and the quote was the same as for NCI's rabbit insurance. The Life policy Terms and Conditions document was also branded as NCI insurance. InsureandGo offer £2,000 of vet fee cover with an excess of £55. They will also cover advertising and reward up to £250, should your bunny be lost or stolen. 4Paws rabbit insurance is a brand name of NCI insurance services Ltd. and when we ran a quote for a 3 year old rabbit in a BN postcode the quote was the same as for NCI's rabbit insurance. 4Paws offer a Lifetime policy for rabbits, with £2,000 of vet fee cover and £750 for complimentary treatments. They'll also cover up to £250 a year for advertising and reward. 4Paws work with Feefo a customer feedback website, and their customer experience score is 4.7/5 based on 379 reviews. Get a rabbit insurance quote on the 4Paws website. Vet Fees - in case your rabbit is injured, develops a medical condition, or gets a disease and needs non-routine vet treatment. Complementary Treatments - in case your vet prescribes acupuncture, herbal remedies, hydrotherapy, or other alternative treatments for your rabbit. Advertising and Rewards - in case your rabbit is lost or stolen, and you incur costs trying to find them again. Pet boarding fees - in case you need to pay someone to look after your rabbit while you are in hospital. As with pet insurance policies for dogs and cats, rabbit insurance usually won't cover vaccinations, pre existing medical conditions, or anything relating to breeding and pregnancy. Do make sure you read the insurance company's policy document carefully before you buy to make sure you know what is and isn't covered. How much does pet insurance for a rabbit cost? Your postcode. As with many kinds of insurance, where you live affects how much you will pay. As vet prices tend to be higher in London and South East England, rabbit insurance prices tend to be higher too. For example, Petplan rabbit insurance for a 3 year old male Netherlands Dwarf rabbit costs £16.60 in South East London, but only £11.94 in Ayrshire where vets are generally cheaper. The rabbit insurance company you choose. When we did our research on rabbit insurance costs for this review, Helpucover had the cheapest prices. Perhaps surprisingly, and in marked contrast to dogs and cats, the breed of rabbit seems to make no difference to the cost of rabbit insurance. We ran rabbit insurance quotes for an English Lop, a Flemish Giant rabbit, an Angora Rabbit, and a Netherlands Dwarf with all the rabbit insurance companies, and when we reviewed them all we found that the price was the same regardless of what breed we chose. This table compares the price per year for each of the Rabbit Insurance companies featured in this article. Prices are based on insuring a rabbit in a BN postcode. No. 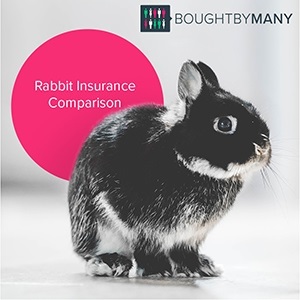 Although GoCompare has a page on its website entitled Compare Cheap Rabbit Insurance and Moneysupermarket has one called Compare Rabbit Insurance Providers, they don't actually allow you to get quotes. Instead, they simply link through to their partners - ExoticDirect and Helpucover respectively. Is it possible to get rabbit insurance with no excess? Unfortunately not. The excess with Petplan is £65, while Helpucover's excess is £50 per condition, per policy year. ExoticDirect has a £65 excess. The main reason rabbit owners choose to buy pet insurance is to provide cover for vet treatment and other medical expenses, in case their rabbit is injured or picks up an illness. Medical conditions which rabbits can be affected by include rhinitis (or snuffles to give it its more common name), and illnesses involving parasites such as coccidiosis and fly strike. Rabbits' fragile bones are also prone to fractures. As an alternative to rabbit insurance, some owners opt to "self-insure" by putting money into a savings account to pay for any treatment their rabbit needs. In the end, only you can really decide whether it's best to have rabbit insurance or simply pay vet bills as they arise. Prices correct on 24th January 2018. "Easy to use and get hold of someone. They are very polite. Good value for money and very clear what they offer at different levels. Docum..."
Why not get a quote with Petplan or Exotic Direct? Do you think there should be more options for rabbit insurance? If so, please join our Rabbit Insurance group. We'd like to use the collective buying power of UK rabbit owners to encourage the pet insurance industry to do their best for rabbits.